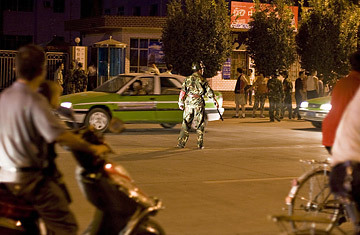 A member of the security forces tries to keep order for people and traffic next to the scene where a bomb attack took place earlier in the day in Kashgar, August 4, 2008. A Video Threat to the Olympics? Kashgar is about as far as one can get from the Chinese capital of Beijing and still be in China. In fact, there is little to indicate one is still in China. Most of the people in this desert town are Uighurs, an Islamic minority group that has clashed again and again with rule of China's majority Han ethnicity. The land surround the city is brown and bare save for irrigated orchards and fruit fields. The white caps of the Pamirs loom in the distance. Women walk through the streets in headscarves, sometimes fully covered from the hot sun and blowing sand. Men wearing skull caps greet one another with handshakes and the phrase "As-Salamu 'Alaykum," Arabic for "Peace be upon you." The language of the Uighurs is closer to Turkish than Chinese, and the architecture  Islamic domes, decorative Arabic script, grape trellises  looks more to the oasis cities of Central Asia than to the east. But the signs of Beijing's power are all around. Kashgar and the huge province of Xinjiang to which it belongs to are, by decree of the Chinese Communist Party, on Beijing time, even though geographically the city should be two hours behind the national capital. Han Chinese make up about a quarter of Kashgar's population, and markers announcing the route of the Olympic flame, which passed through here in June, line the streets. Banners hang that read, "All ethnicities hand in hand welcome the Olympics." This week, however, some locals may have decided they wanted none of Beijing's Games. Chinese authorities say two Kashgar men, taxi driver Kurbanjan Hemit, 28, and vegetable vendor Abdurahman Azat, 33, carried out an attack on security forces in the city. The local government says the pair, who are Uighur, were driven by religious extremism to attack a group of Chinese border police, killing 16 and injuring 16 more. "They said that religious beliefs are more important than life, more important than the prosperity of their familes, even their mothers," said Shi Dagang, the Communist Party secretary for Kashgar prefecture. "They were trying their best to perform jihad." The scene of the incident: the entrance of the Yijin Hotel, a dingy yellow three-story building with reflective windows. A visit to the site a day after saw a few police milling around but nothing to give the impression that the spot was more significant than others in this highly-guarded city. Shi told a press conference that the pair planned their attack for a month. He said that on early Monday morning the two suspects stole a large Dongfeng delivery truck. Shortly after 8 a.m. Beijing time (or 6 a.m., in the unofficial local time) one of the suspects telephoned the other to say that a group of Chinese border police was on a training jog outside their compound. The driver accelerated the truck to a high speed and plowed it into a group of 70 from behind. The truck hit a pole and turned over, and the driver lost an arm in the accident. They attacked the police with two homemade bombs, Shi said. Authorities recovered nine more bombs, a homemade gun, two long knives and two daggers. One day after the assault the scene outside the Yijin Hotel roughly matched the description given by authorities. Three saplings that had stood outside the hotel the day before were gone, a neighbor said, and detached electrical wires dangled from above. The front entrance of the hotel was covered with a red, white and blue plastic tarp, and some of the windows were broken. But there were no signs of blood or explosive detonations on the sidewalk outside the three-story yellow building, which is backed by the old city wall. Neighbors say that the road around the hotel was closed for two hours after the attack. Residents say they knew of the attack, but none acknowledged witnessing it. "I don't really know the situation," said a Chinese Muslim man of the Hui ethnicity, who owns a drink store near the Yijin. "I'm not afraid. The truth is it's pretty safe here. It's not like this sort of thing happens every day." That's true, but Chinese authorities claim the attack is part of a long-running effort by Uighur separatists to tarnish the Beijing Olympics. Without giving details, Shi said that a preliminary investigation found similarities between this week's attack and evidence uncovered from a raid on a Uighur separatist training camp in January 2007. "Starting from last year the East Turkestan forces at home and abroad tried sabotage and violent activities targeting the Beijing Games," Shi said, using the historic name of an independent Uighur state which some groups have hopes of restoring through violent struggle. "The East Turkestan Islamic Movement and the East Turkestan Liberation Organization are the two most active ones." Shi cited online postings that describe how to make bombs and poisons, the attempted attack on a flight from the Xinjiang capital of Urumqi in March, and unrest in Hetian (or Khotan in the Uighur language) in March. He quoted the leader of the East Turkestan Liberation Organization as saying, "The Beijing Games are our one last golden opportunity to inflict such attacks on China. Even though we know we are weak like an egg on a stone, they will try to smear the stone." Shi said that he believed Kashgar residents were united in opposition to such violence. "Kashgar people of all ethnic groups are a strong foundation to combat East Turkestan forces," he said. He promised "a severe battle" against terrorism, and said the area's recent economic growth was a sign that the region was stable and prosperous. "We have a unitary ethnic environment and a very stable society," he said. "Even a midnight, people still have no problem strolling or jogging on the streets." Indeed, Kashgar seemed remarkably calm after the attack. Residents strolled past the Yijin Hotel as if nothing happened there. Children rode bicycles on sidewalks, and donkey carts pulled loads of fruit. Police checkpoints dotted some of the city's backroads, and airports and some hotels in the region had security checks at their outside entrances. Kashgar police detained and roughed up two Japanese reporters who arrived the day of the attack, according to wire reports, but by Tuesday they merely tape recorded journalists from a distance. Despite the relative calm, signs of dissent were apparent. "There's a lot of things we keep in here," one Uighur shopkeeper said, tapping on my chest. He said that decades of Chinese rule had changed the mentality of his people. "We've been under a lot of pressure" he says. "For some minorities the conditions have been good, but not for us." An old man sitting near a sign that said "Unauthorized pilgrimages are illegal religious activity," complained that the city's Han residents were given all the economic opportunities. "Do you think people are happy here? Do you see them smiling, dancing, singing? No, because they have no work," he said. He argued that the influx of Han settlers, and the authoritarian control of the Communist Party were the sources of Uighur anger. "Why are people unhappy? Because power is in control of the Communist Party."